I can't believe how the time is flying by - we're on week #7 of our veggie deliveries already! Nearly two months have passed since we've started. And a hot two months they've been! With temperatures hitting the high 90's and nearly 100 every day, the tomatoes are really coming in! But not so much for some of the other veggies! 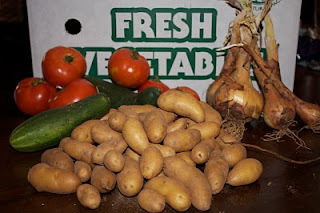 This week's box includes fingerling potatoes, cucumbers, onions and tomatoes! I'm sure some salads are in our near future. And tomato sandwiches for my and my daughter. Not quite sure about the potatoes yet - but perhaps we'll have "breakfast for dinner" complete with hash browns. Sounds good to me! Girl, you are very inspiring w/these veggie posts! I've GOT to eat more veggies!